Dental Implants in Central Park West | Stewart Gordon, D.D.S. The office of Stewart Gordon, DDS provides dental implants on Central Park West as a comprehensive tooth replacement option to improve aesthetics and oral health. Dr. Stewart Gordon and his team exceed patients’ expectations by delivering quality care. Our dentist is an expert in creating treatment plans that achieve ideal smiles, providing patients with renewed confidence. 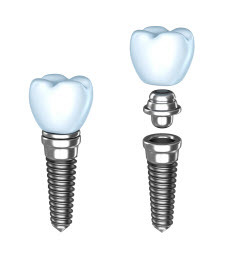 Unlike traditional prosthetics, dental implants replace teeth from root to crown. Conventional dentures can easily slip or become dislodged, decreasing patients’ willingness to eat or speak in front of others. This is not an issue with implant-supported restorations as the posts supporting the prosthetic are placed directly into the jaw. This provides constant, reliable support, giving patients the freedom to enjoy their favorite foods without feeling self-conscious. Single-unit unit crowns restore individual teeth anywhere in the smile. Bridges replace one or more teeth in a row. Snap on overdentures restore entire arches of teeth and may be removed and reinserted by the patient. The All-on-4 Treatment Concept offers full smile rehabilitation with permanent, screw-retained, full-arch bridges. 3D images are taken to determine placement. If patients are unable to come into our dental practice to have their smiles scanned, our mobile imaging unit meets our patients at their requested location. Dr. Gordon places implants in-office. He can also provide bone grafts and sinus lifts when necessary, allowing patients who were previously unable to receive implants to obtain comprehensive teeth replacement. Our dentist takes a gentle approach to treatment to ensure your comfort on the day of surgery and during recovery. There is little downtime associated with this procedure. Most of our patients are able to go back to work the next day. At the office of Stewart Gordon, DDS, we provide dental implants to restore patients’ smiles. Dr. Gordon is an implant expert, helping them reach their dental goals. Call our Central Park West dental office today to schedule a consultation with our dentist!